Thai food is often thought of being hot and spicy but chilli did not originate from Thailand. There are cuisines from other countries such as India and Mexico that commonly use chilli. Although Thai curry cooked with coconut milk was mainly influenced by Indian curry, it became so popular that the Thais developed their own taste and recipe and then known as Thai curry. Thai curry uses less dry spices and more fresh herbs such as lemongrass, galangal, kaffir lime and also shrimp paste. • Chilli helps respiratory system, blood pressure. It contains vitamin C, E, B1, B2 and B3. • Shallot helps prevent a cold. • Garlic helps reduce cholesterol and prevent heart disease. • Coconut milk gives energy. 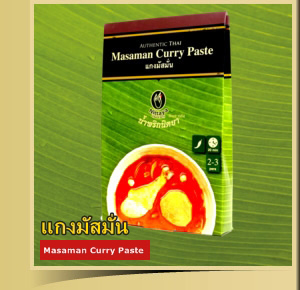 • Shrimp Paste contains calcium and vitamin A. These are just small examples of the advantage we can get in just one dish. It is a knowledge Thailand discovered and inherits through generations. International taste doesn't mean the traditional taste should be compromised. It should be appreciated and preserved by all cultures. Thai curry is in fact very simple to prepare, just eat with rice. The quantity recommend in this web site is for guide line only. You can use more or less depending on how tasty you want it. Copyright 2014 NITTAYATHAICURRY.COM | All right reserved.